Here we are again! ?? It has been quiet from our side. Sorry for that. The last few weeks have been pretty hectic for us. Here is a new and (be prepared) BIG update about the last 4 weeks and the coming months. Sit tight. Our finished Kickstarter campaign got some traction from local game shops in the Netherlands, they are currently thinking about ordering a large amount of copies. Their feedback, the lessons we learned by doing a Kickstarter project combined with your feedback made us realize that there are a few things that we can improve to give you the best possible experience we can give you. First, the name of the game. When we decided on the name Tamps it was still a small hobby project. As children we called it Tamps, the name has sentimental value for us and we wanted to honor that. 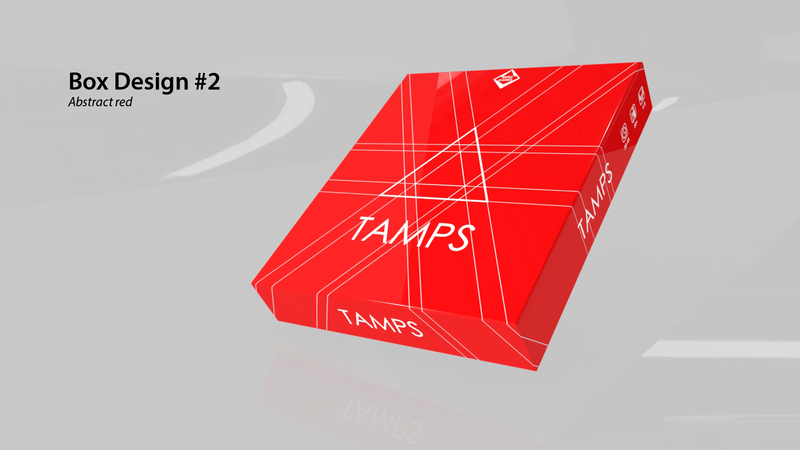 Now that the game is out in the world, people are asking the question: “Why the name Tamps?”, a lot, really a lot!!! We think it is because the name doesn’t speak for itself, therefore, we are thinking about changing the name to something more familiar and less associated with that certain period of the month…. :p For this we can use your help. Of course we already have our own ideas but we really would love you to inspire us for a beautiful name that links to either: collecting cards, signaling, a team game, chaos, memory, bluffing, or another aspect of the game you love. Please share your ideas with us by commenting down below. Second, the box of the game. The colors are very busy and not representing the clear design style of the cards. Therefore we are also redesigning the box to a more sophisticated style. Which will make the connection between the cards, our triangles and the box in your hands much stronger. One of the first new designs you can see below. What do you think??? Let us know in the comments below. Third, the cards of the game. They are perfect as they are! ?? We would never want to change the design of these, because everybody loves them! So the experience of the game itself will stay exactly the same as it is. Don’t worry!!! We are however looking into upgrading the quality of the cards. Since we know exactly how much we have collected from Kickstarter, plus we might get another investment from the local game shops. If this deal goes through then we can upgrade the quality of our playing cards for everyone! ?? To conclude. Please understand that we are working hard on this project and that we want to produce the best for you. We really appreciate your support. After the new year we will send out a survey for your shipping address and other information. For now if you have any ideas for the name of the game or the box of the game, please let us know. If you are Dutch and would like to give Tamps away for christmas then we have a gift voucher for you that you can print and share with your friends and family. Download it here. ⟵Developer Diaries #12 – Would you like to review our game?